Micallef Tonight – Shaun Micallef Online! After the award winning Micallef P(r)ogram(me), Shaun had continued to be noticed with a successful Logie hosting gig in 2001, and Welcher and Welcher on the ABC at the start of 2003. Channel Nine felt it was time to revive live variety, and chose Shaun to be the focus. Thus Micallef Tonight was born. Airing at 9:30pm on a Monday night, the show began on 12th May 2003 – the night after that year’s Logie awards. It was originally to start in March 2003, but a number of test runs were done to iron-out the format: Shaun had never done live TV or real interviews before. The first show was a success, with well-seasoned guests such as Barry Humphries and Kath and Kim making up for Shaun’s nervousness and lack of experience. His trademark humour was front and centre, beginning with a montage of the greatest moments so far – ie. the first 30 seconds. The premiere episode rated extremely well in Australia, especially in Melbourne where it’s broadcast, coming 12th in Melbourne’s ratings with an audience of almost 500,000 and well over one and a half million nation-wide. As the series continued, some of the more rehearsed material began to run out, and the show became a little more free-flow, increasing in surrealist humour. Perhaps due to this, ratings began to dip over the course of the series. The show also had strong competition from “Enough Rope with Andrew Denton”, which ran at the same time – in one episode of MT, Shaun can be seen watching Enough Rope instead of the musical act on his show. The series had only been contracted for 13 weeks, but was extended by another 20 weeks in June 2003. It was therefore a shock when the Tuesday after the 13th episode, the show was axed with no chance of a farewell. In Melbourne, Micallef Tonight drew only 293,624 viewers, and 821,192 nationally being beaten soundly by Enough Rope with well over a million viewers across the country. Shaun and show producer Todd Abbott were shocked when they learned of the decision, especially since just a month ago Nine extended the show to the end of the year, even booking guests until the end of November. This article appeared in The Australian, August 7 2003, by Sophie Tedmanson: Comedian Shaun Micallef’s left-field tonight show is the latest interview program to get the axe, proving that quirk doesn’t seem to work anymore when it comes to homegrown variety-style television. 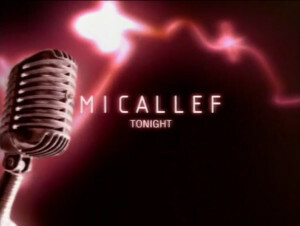 Micallef Tonight, which debuted in May, has been dropped by the Nine Network following dwindling ratings, just weeks after Seven ended Greeks on the Roof a week early. Despite a cult following from his critically acclaimed sketch show – Micallef Pogram – which ran for three seasons on the ABC, the comedian’s move to Nine has been shortlived. It is the second big blow for Micallef, whose sitcom Welcher and Welcher has not resumed since its first season on the ABC earlier this year. Micallef Tonight started well. The first episode, featuring guests Barry Humphries and Dannii Minogue, drew 1.4 million viewers. But the comedian’s biting humour and quirky segments fell flat and Micallef Tonight only managed to attract 786,799 viewers last Monday. Seven is yet to make a decision on the future of Greeks, which featured Effie, aka comedian Mary Coustas, and her loud-mouth family bombarding guests with scripted jokes in the style of the BBC’s The Kumars at No 42. In contrast, Rove Live – the standard tonight show format – is enjoying a popular third season on the Ten Network after host Rove McManus took home three Logie Awards this year, including the gold. Andrew Denton’s one-on-one interview show Enough Rope has surprised the critics with good ratings for the ABC and survived the broadcaster’s cuts announced this week. But Micallef, whose debut show rated the highest out of any of the four variety programs this year, couldn’t sustain the viewers. While promoting his show back in May, Micallef described the format as “an odd show to have on Channel 9”. According to a statement from Nine, Micallef was “a great talent. We are disappointed the program didn’t reach our ratings expectations”. Micallef is believed to have taken a break with his Melbourne-based family and yesterday would not comment about his show’s axing, but according to his agent the comedian will not stay quiet for long.